Sony Xperia XZ Premium hands-on hands on review | What Hi-Fi? 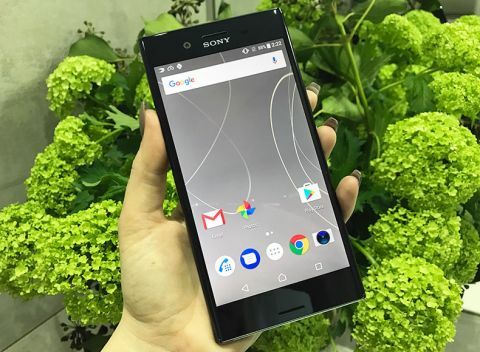 When Sony launched the world’s first 4K phone, the Xperia Z5 Premium, there was something about it that felt a little ahead of its time, and ultimately a little pointless. With no 4K content to enjoy easily on a mobile, it seemed like just another spec in the ongoing smartphone spec sheet war, and it failed to set the world alight when it came to sales either. It's a little different with the new Sony Xperia XZ Premium. Not only do we have an improved 4K screen with the addition of HDR, but we also have the 4K content, thanks to a partnership with Amazon. But can the rest of the phone hold up its part of the bargain too? Read on for our first impressions. The Sony XZ Premium features a 5.5in 4K (3840 x 2160) HDR screen - a world-first in a phone. As ever, it takes cues from Sony’s Bravia TV line, with built-in Triluminos for mobile for a wider colour gamut, X Reality for mobile for sharper images and Dynamic Contrast Enhancer for deeper blacks and whiter whites. We’ve long loved what Sony Mobile does with its flagship displays, so we’re really hoping this is the case here too. Since Sony was running a very early version of its Android software, we weren’t able to see too much content on the phone. However, from a few flicks around the menus, everything certainly looked bright and sharp, though we’re sure the 4K resolution will really only come into its own when watching movies. We got a quick demo of this, viewing the XZ Premium next to the 2015 Z5 Premium, and the improved contrast and vibrancy on the XZ Premium’s HDR screen was certainly apparent. There were deeper blacks, richer colours and highlights more nuanced and detailed. We’ll be interested to try this out with a wider range of content in our full review. As mentioned in the introduction, some of that content will be from Amazon, thanks to a partnership to offer a range of Amazon Originals in 4K HDR through their app. At first glance, the design of the XZ Premium isn’t unlike that of last year’s Xperia XZ, but it does get a premium boost to honour its name. Gorilla Glass 5 now wraps itself around the entirety of the phone to improve durability, with a chrome finish on the back to create a mirrored effect. This doesn’t create quite as much of a smudgy fingerprint nightmare as the Z5 Premium’s reflective design did thanks to a new easy-clean coating, but it still picks them up. Be prepared to be polishing your phone on a regular basis if you get this. At 7.9mm, the XZ Premium is a little chunkier than some of Sony’s earlier phones, but it works in its favour. It’s easier to hold than some of the super-slim handsets, and its curved edges really help to make it feel secure in your hand. Most importantly, it looks smart, and is probably one of our favourite iterations of Sony’s mobile design. Glass isn’t great for mobile phone signal though, so there are metal covers at the top and bottom of the phone to help with that, while Sony’s fingerprint scanner and power button sit on the right hand side, with the volume rocker above it (this has been moved following customer feedback). The XZ Premium will be available in a choice of Luminous Chrome or Deepsea Black, which has a subtle tinge of blue to it. Sony will once again support high-resolution audio, along with its DSEE HX upscaling for lower-quality files. It also has Sony’s LDAC technology on board which promises to transfer three times more audio data over Bluetooth to wireless speakers and headphones. We were unable to test either of these features out due to the early version of the software, so any critical listening will have to wait for our full review. Based on our previous tests of Sony phones though, we’re hopeful for a good performance – and we’re glad to see it’s kept the 3.5mm headphone jack too. Aside from the screen, the camera is one of the big talking points of the XZ Premium, as it’s been completely re-built from the ground up compared to last year's model. The result is Sony’s Motion Eye camera, a 19MP sensor that incorporates imaging know-how from across Sony’s photography side of the business. It borrows some technology from premium compact cameras, such as memory being stacked directly onto the sensor to allow for five times faster image scanning and data transfer. What this means in practice is two things. First, the ability to capture super slow motion videos at 960fps (most are around 240fps), and second to capture images before you have even pressed the button. Yes, really. Predictive Capture automatically starts buffering images when it detects motion, taking up to four images in the second before you press the shutter button. On top of all of this, the camera claims to capture 10% larger pixels for brighter shots in low light, while the Bionz mobile processing helps to guard against excess noise. Once again, we’ll need to put a lot of this to test in our full review, but we did get to try out Sony’s super slow motion video capture, and the results were very impressive indeed. Even just filming a glass being washed up or a cocktail being poured (Sony's choices...) looked impressively dramatic and the detail on offer was remarkable. The real-time footage after the slow-mo sections on our videos didn’t look the most smooth and natural, but it’s the slow-mo that’s the star of the show here. The Xperia XZ Premium will run on the Qualcomm Snapdragon 835 chip – the same chipset that's expected to be found in the Samsung Galaxy S8 and one of the most powerful mobile processors around. In particular, it’ll be able to offer download speeds of up to 1Gbps thanks to the integrated Snapdragon X16 LTE modem, which should make 4K movies on-the-go a reality. This is supported by 4GB of RAM alongside 64GB of on-board storage and a microSD slot for expansion. Smart Stamina battery mode is back, which learns your usage and can warn you when you might fall short of juice later on in the day, prompting you to switch to Stamina mode earlier to help prevent it. Waterproofing also returns to the Xperia XZ Premium, so it’ll survive an accidental dunk, as does Qnovo Adaptive Charging, which promises to extend your battery lifespan while offering much quicker charging times. Once again, due to the constraints of the preview sample we spent some time with, we’ll have to get a real feel for performance during our full review. There’s nothing like a world first at MWC 2017, and the Sony Xperia XZ Premium is one of the more exciting ones, with the launch of a phone that could really lead the way for premium 4K viewing on a smartphone. It was a shame we couldn’t put the XZ Premium through its paces more during our preview, but we're excited to get it in for a full review when it launches in a few months time. Here’s hoping it can live up to its specs.